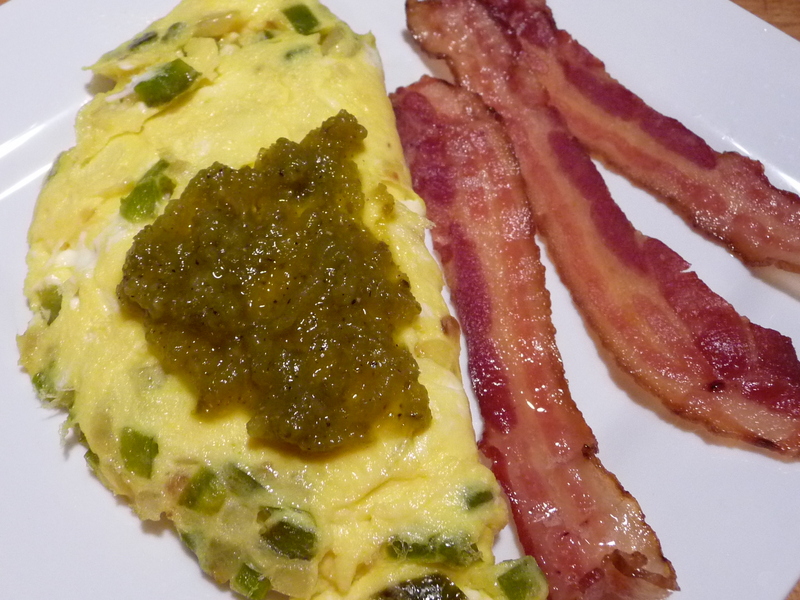 What you end up with is a thick, chunky, bright green sauce that is perfect for any eggs (huevos rancheros anyone? 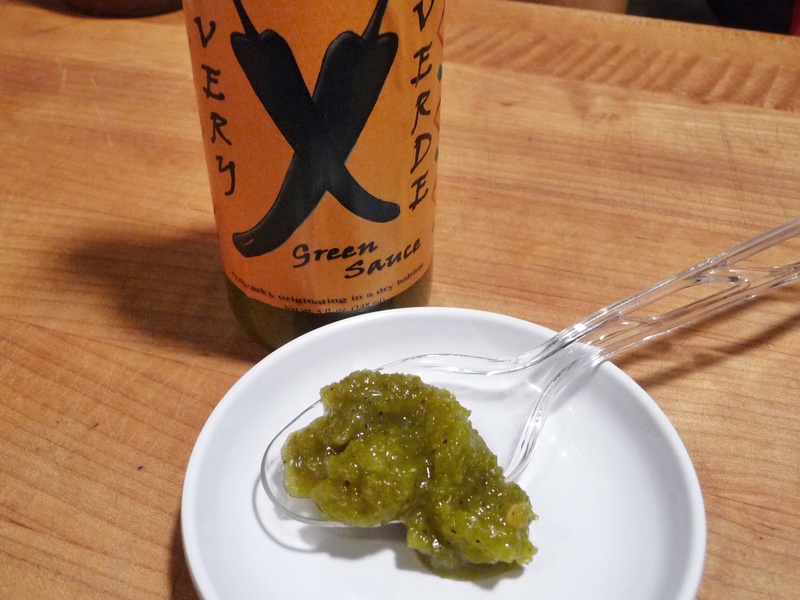 ), a bowl of chile, nachos out the ying-yang, tacos and burritos… this mild green sauce just works everywhere. Except pizza. I like to see red color (and flavor – red is a flavor, right?) in my sauces for pizza. Aroma & Taste: – First up is the aroma of fresh, fire-roasted green chiles. 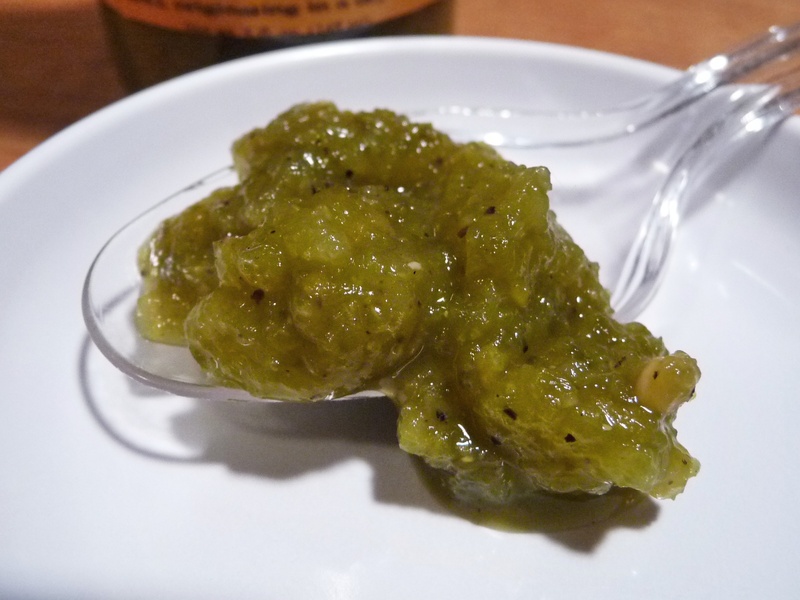 Authentic Hatch New Mexican Chiles have a pungent aroma and taste that is like no other mild green chile. When you taste this sauce, you will enjoy those fire-roasted chiles – quickly followed by the mild heat of jalapeños. Oddly, the honey and lemon juice don’t seem to be big players here, rather they are supporting players that just help round out the flavor and balanced taste of this sauce. Texture & Appearance: This stuff is THICK! Think relish thick. It takes some shaking to get it out of the bottle. I hope Xerarch’s finds a way to thin it down just a bit – to make it a more pourable sauce as opposed to how it currently glops out of the bottle. 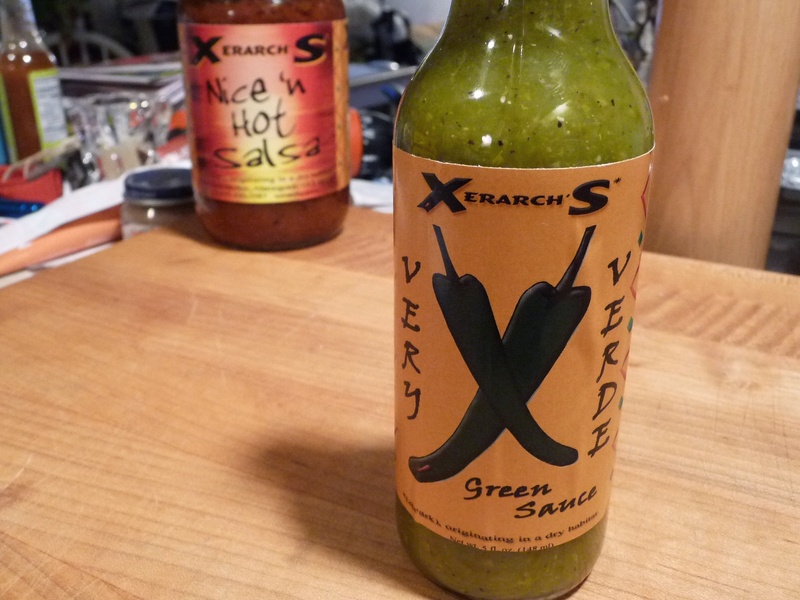 Heat Level: – Very mild heat here – this sauce is all about the green chile flavor, not the heat. A nice change of pace for a sauce you would eat on the above mentioned foods. Simple graphics that tell all. Label/Graphics: You can’t get much simpler than this. I love the label. I would reach up to the shelf at a store and grab 2 of these based on the simplicity alone. Kudos to Xerarch’s for the balls to create a label that is what it is, and simple is better when the design just works. Xerarch’s Very Verde on an omelette – a perfect combo? Overall Rating (Taste on Food, Final Thoughts): – There’s not a lot of heat going on here, but it tastes great on egg dishes, chili, nachos, tacos – this is a good sauce that makes the best use of the New Mexican green chile. I wish it was a thinner sauce, but it does bring on some decent flavor once you coax it out of the bottle. Thanks Brian, great review. The sauce wasnt supposed to be that thick and the next run wont be, as long as thinning it out doesnt change the flavor. Hey, that is really good to know! Good luck with the next run of the sauce. I could see mixing some of this and cheese and stuffing a burger with it. I rarely make stuffed burgers, but that does sound like a delicious idea. Thanks Chris. I havent used it to stuff a burger but it is great on burgers. Fries too. This green sauce sounds fantastic.